Crafty moms everywhere have their sewing machines humming, glue guns hot and ready, spray paint poised...ready to finish the last minute Halloween costume or crafts. I'm not a costume maker. I know this information may catch you off guard. And maybe someday I will change my tune. But right now my boys are into classic things; superheros, ghosts, skeletons etc. Things I can find readily available at any thrift store for cheaper than I can make it. This year I actually found a handmade Robin (of Batman and Robin) costume at our local thrift store. I know whoever slaved away to make this elaborate outfit would be overjoyed to discover that there is another little boy in the world who chooses the sidekick as his favorite hero too. 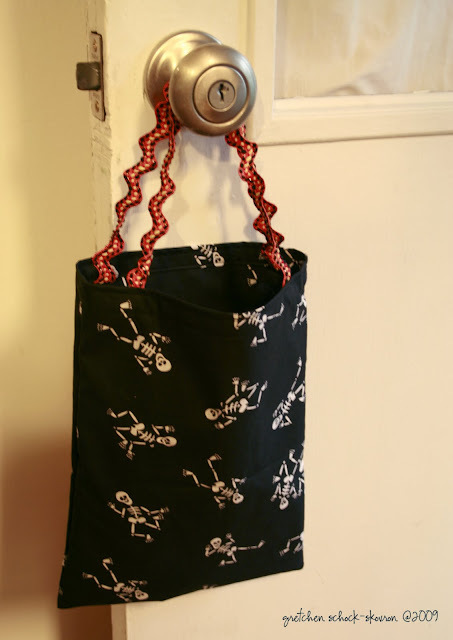 Zane discovered this fabric remnant during a recent Joann's visit and I promised to make him a trick or treat bag to match his skeleton outfit. Sewing machine buzzing at 9am, and I am finished in plenty of time to fill it with loot tonight. Have a happy Halloween!! !